Very common failures in the outdoor air conditioing unit. 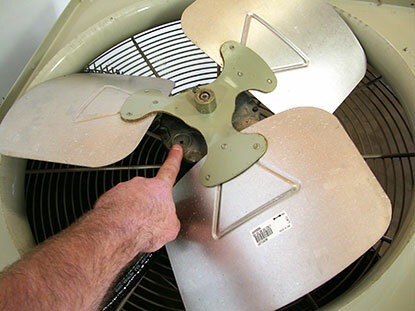 Here is a troubleshooting guide for outdoor fan motors. Technically this is really called the condensing unit fan motor. The outdoor section of your home air conditioner is called the condensing unit because this is where the air condition system’s compressor compresses and condensing the gaseous Freon into liquid Freon. 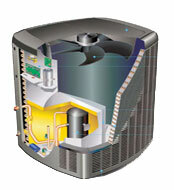 The fan motor is what moves the air across the outdoor cooling coils of the air conditioner. This removes the heat from the Freon and sub cools it (cools it below its saturation point). Not everything lasts forever. 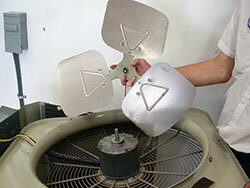 A typical air conditioning fan motor will last 12-15 years in our Southern California Climate. The bearings wear out and the motor fails. While most air conditioner fan motors have permanently oiled bearings, some still need to be oiled a drop or two. This is something that we perform regularly on our tune up. For only $39, if you use and print the coupon above to the right, you’ll receive a air conditioning tune up and evaluation. Corroded terminals and loose wire nuts cause an increase in the amount of heat across the wiring. This incre ased amount of heat reduces the amount of electricity the motor is allowed to operate on which causes it to run at an elevated temperature. This elevated temperature leads to premature breakdowns. Give us a call and we’ll help you with this problem. Our $39 full system tune up and evaluation can solve this for you. 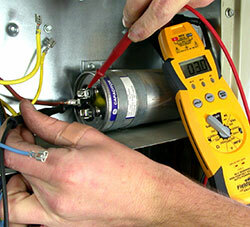 One of the most common breakdowns for the outdoor fan motor on an air conditioning system is capacitor failure. Loose connections and wear and tear lead to failure on the hottest days. The hottest days are the days when the electrical voltage coming into your air conditioner is the lowest. It is also the time when your air conditioner needs the most amount of electricity to start and run. These combinations are destructive if your air conditioner isn’t in peak running condition. Give us a call and we’ll help you with this problem. Our $39 full system tune up and evaluation can solve this for you. Be sure to print out our A/C tune up coupon above. I would like to say I found working with your company to be a pleasure. …professional, hard working, timely competent, friendly and did an excellent job. 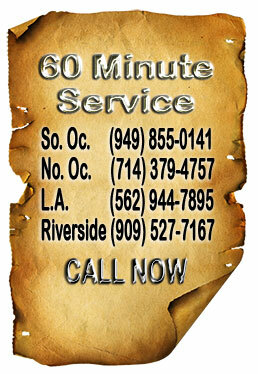 They were very professional and found the problem in a timely fashion and had out furnace and lights working perfectly.